“I decided to create a unique concert concept that was start to finish full of monster hits by iconic vocalists,” explains John Payne, The Rock Pack creator. Huge screens adorn the stage and the set contains an area where each singer briefly talks about their career before launching into some of their most revered songs. Classics such as I Wanna Know What Love Is (with a gospel choir), I Want You to Want Me, Don’t Stop Believing, Heat of the Moment, She’s A Beauty, Black Magic Woman and many more will be performed. On Friday December 16th The Rock Pack hits town. Prepare for an extraordinary unprecedented concert at Phoenix’s beautiful Comerica Theatre. Iconic Singers will perform Iconic Songs in a two hour hit laden Classic Rock extravaganza. 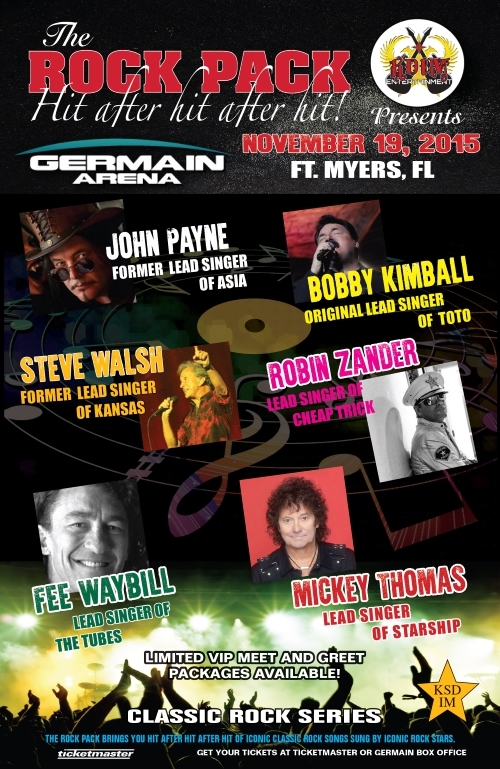 Fort Myers, FL – November 19th sees the arrival of THE ROCK PACK at The Germain Arena, Ft. Myers, FL. This stunning show features the classic hit songs sung by the original singers; Dust in the Wind, I Want You to Want Me, We Built This City, Africa, Surrender, Beauty, The Flame, Rosanna, White Punks on Dope, Carry on My Wayward Son, Dream Police, Hold the Line, Nothing’s Gonna Stop Us Now and more.